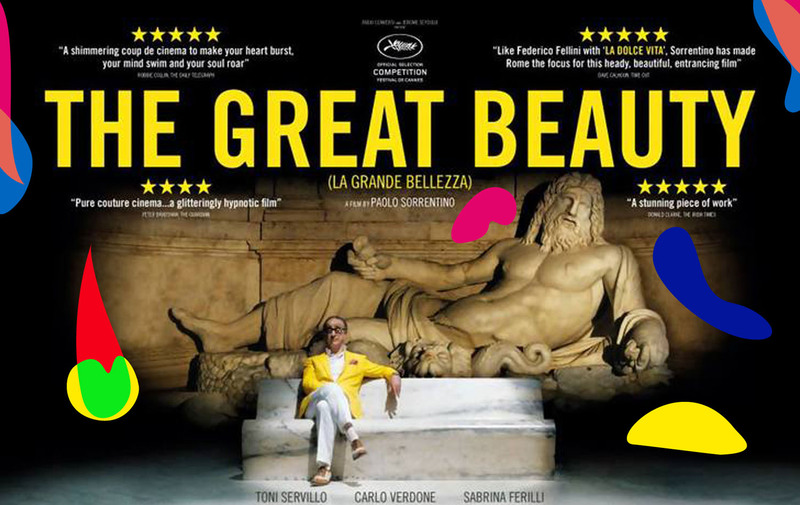 “The Great Beauty” (La Grande bellezza), a joint-Italian/French produced film released in 2013 from the Napoli-born director Paolo Sorrentino, who also assumed story and script-writing duties. At the time of writing (02/2014) “The Great Beauty”, having premiered at the Cannes Film Festival, has won awards at the BAFTAs, the Golden Globes and the 86th Academy Awards. Writer Jep (Toni Servillo) spends his 65th birthday in Rome, city of splendor and beauty. Jep is a writer, but with only one novel to his name, published many years ago. Able to rely on that one success, Jep foregoes further writing, living a life free of financial pressures. Nights after nights are spent at the hedonistic and lavish parties of the wealthy and intellectual elite, in a lifestyle that is as decadent as it is extravagant. The reason behind his failure to publish again is that he never found his own Great Beauty. His search for that continues to this day. This film is a tribute to Rome itself. To this day, many directors have used Rome as an inspiration or even as a protagonist of sorts in their films. Critics have highlighted the strong influence of Federico Fellini’s “La Dolce Vita”, but I feel that Sorrentino has gone further, depicting both sides of Rome’s mask – the beautiful and the ugly – in a way that Fellini never did. The film begins with a Japanese tourist attempting to capture the beauty of this Eternal City – but collapsing and dying in the process, presumably of shock or a heart attack. What follows is the stark profile of the lush yet poisonous nightlife of Rome. What is striking is that this is Rome depicted by a Neapolitan director. It’s a vision of Rome not held by the local populace. It’s a beautiful artistic piece, born of Sorrentino’s cinematic mastery and eye for framing a scene. From the conversations of the debauched elite in the film, few may also draw comparisons to Antonioni’s The Night or Scola‘s La Terrazza. What I notice in Sorrentino’s work is the frequent appearances of men struck with loneliness as well as the prominence of Death as a theme. Perhaps this is an insight into the heart of Sorrentino, who lost both his parents at a young age. The death he portrays is not always necessarily a physical one; it often points to the spiritual or emotional. Be aware of death, but live positively with hope for the future. That’s why, in that spirit, Sorrentino’s Jep picked up the pen and started creating once again. SaraWaka: Ciao Micol! I had a call from an agent in Rome, who said there is some kind of audition in Rome tomorrow, so could I come down from Milan… something to do with some dude called Piero… maybe Paolo Sorr…etto or something. Some film director. What’s the deal? I don’t fancy it. Micol: Hang on, was it Paolo Sorrentino??! SaraWaka: Yes! Maybe, something like that. Micol: Sara Waka, you dear are an idiot. Get down there asap. 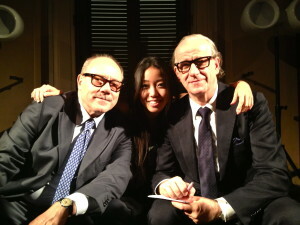 That was my introduction to the film, The Great Beauty (La Grande Bellezza). Rome in summer is brutally hot. In the middle of that 38-degree heat, I waited for my name to be called in the mercilessly aircon-free offices of Indigo Productions. I sat in between some old guy who reminded me of Leonardo Da Vinci and some old lady who looked like she’d worked one too many nights in some dodgy nightclub. The scenario was strange enough that I found myself looking for some secret camera filming me for one of those candid camera prank shows. I found out later that the lady was in fact the actress Serena Grandi, popular back in the 1980s, and the maestro was the Italian actor Giulio Brogi. Staging, wardrobe check, there were a few things that caused me to undertake the journey from Milan to Rome three or more times. All travel and lodgings were covered by the production house, but one week prior to my filming, I got properly cocktailed in a Milan club with the Toilet Paper Group and took the old acting phrase too far and did actually break a leg. Now, I wasn’t too set on becoming an actress, but I was still looking forward to my once-in-a-lifetime-opportunity to be in a film. With tears of pain in one eye and tears of disappointment in the other, I picked up the phone and called the production house. The next contact was the following day, in the form of a phone call received as I was lounging around the hospital. Giulio: The director has declared that broken ankle or not, this film needs SaraWaka! This is great news! I’m thrilled as well! At that very moment, I couldn’t believe the turn of events, but, truth be told, taking the train from Milan to Rome with a pair of crutches was a bit of a nightmare.Even worse because the first time I had to make the journey was the day after being discharged from hospital post-operation. Flustered and tired, I arrivedat Rome station with Giulio waiting for me at the platform. The scene I was in was shoting a country house on top of a hill. It was amazing: more pieces of art than I have ever seen and a massive set swamped by the cast and crew. A few hours later a man rode in on a bike with a bad case of helmet hair: the director had arrived! “Tough time SaraWaka, eh? Thanks for comingall the way down to Rome. So,let’sgetstarted: ready for some singing and dancing?” (You’re joking, right…were the words clamouring to get out of my mouth) Instead I said: “Emmm, I just got out of hospital yesterday…” “So youcan’t dance?” (Of course I can’t bloody well dance…were the words, again, clamouring to get of my mouth. Instead, I clamped my lips firmly shut.). I had many interesting experiences on set. The process of so many people working together to create a film was fascinating, but involved way more waiting around than I had imagined and, truth be told, there were moments of boredom. 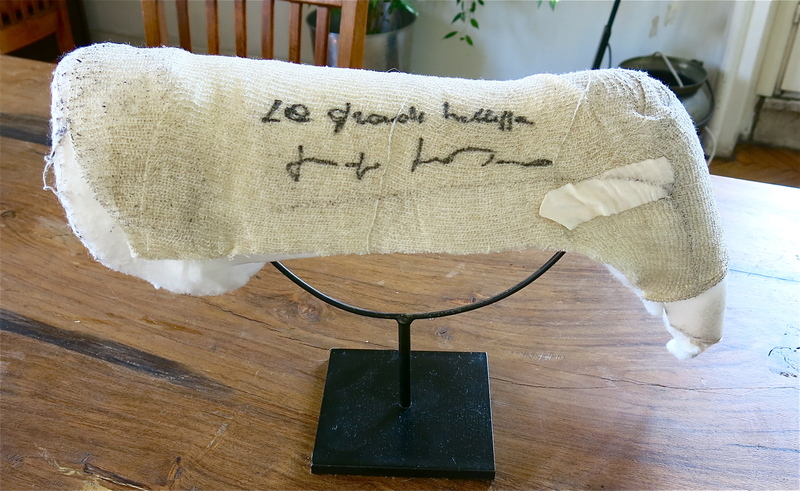 Whether it was good luck or bad, the breaking of my leg thrust me into the midst of the great actors and actresses of Italy. Not watching any Italian TV, I struggled to know who people were, with the one actress I did recognize being Sabrina Ferilli. There was also an oldish man who was friendly with me, despite me just having 3 mins of screentime amongst all these VIPs. He was bearded and bespectacled. “Is that cast part of your costume?” he asked and up I got to chat. I learnt a few hours later that he was the famous comedian Carlo Verdone. I also learnt that Toni Servillo, who was playing the lead Jep, had interests beyond film and was also an accomplished stage actor. The film production wrapped up in November. Waiting in anticipation for a few months, it was a day in March when my friend Micol phoned me. “SaraWaka! Okay, don’t be startled…” was her opening and only words before she sent a link. It was a link to a video of exclusive deleted scenes from The Great Beauty. My screentime in the main film seemed to have been cut, but I lived on in the deleted scenes!! When May came around, it had been decided that The Great Beauty would open the Cannes Film Festival. At that stage, I thought my scene had been totally deleted and was a little down about it, but I thought I would go down to Cannes as I had been part of the movie after all. It’s all experience after all! And with my thinking switched to positive, I was Cannes bound! It was my first time at such a big film festival and the streets oozed gorgeousness as I found myself surrounded by famous directors, actors, models and celebrities. But more than all of that, the lasting memory of the festival was seeing the film, the product of so many months of hard, back-breaking work. 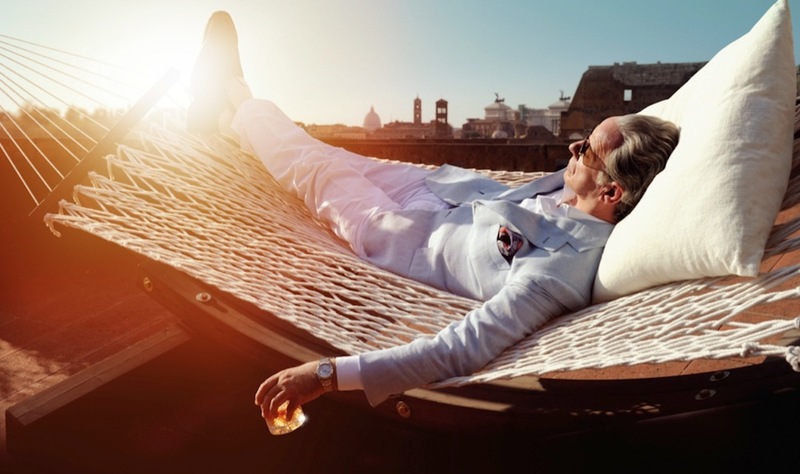 It sailed far past my original expectations, and I found myself astounded at how Sorrentino had so artfully distilled a vision of Rome onto the film. It was fine and detailed, yet loud and bold; rough yet artistic. (I was also pretty chuffed to see that I was still in there, even if only for 3 glorious seconds!) But even if I had been discarded totally to the cutting room floor, I would have still be grateful to have had even the smallest of connection to this wonderful movie.